Access Profiles, Inc.: Tips to Help You Get Your Resume “Background Check Ready”! 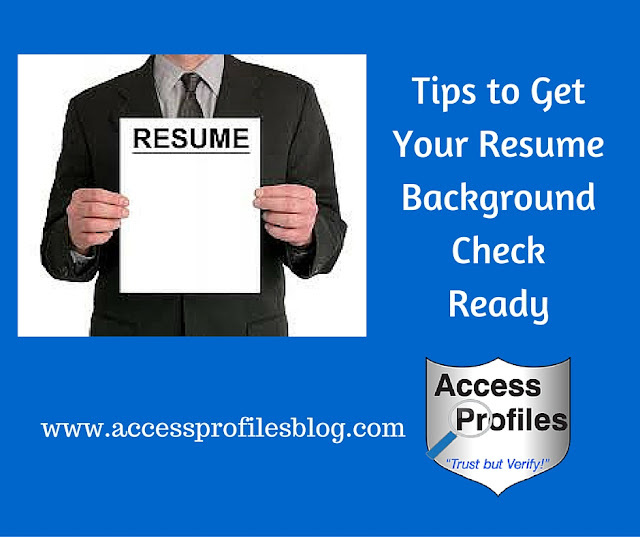 Tips to Help You Get Your Resume “Background Check Ready”! Looking for a Job? Will Your Resume Help You or Hurt You? one thing you can count on is that some type of background check will be part of the equation. Most employers will check to see if you have the education, skills, and past experience needed for the job ~ and your resume will most likely be your first introduction. Job Seekers Take Note ~ It is vital that Your Resume be “Background Check Ready”! "Tweet This"
Making sure your resume is completely truthful is the best start. All your information needs to be clear and accurate. Rule Number One ~ Make Sure Your Resume is "Clean"! This means checking for any typos or spelling errors and being as detailed as possible. A “clean” resume with correct addresses, contact information, dates, etc. will make it much easier to verify and will put you in the good graces of the people hired to check it (and word of this is sure to get back to the decision-makers!). Rule Number Two ~ Make sure You Never List a Degree You Have Not Earned. This is very easy to verify and employers are sure to check. If there is any question, check it out with your school before listing it on your resume. Rule Number Three ~ Make Sure all Past Employments are Accurate. List exact dates if at all possible. It is also best to make sure your title of employment is correct. Many companies use different job titles, so make every attempt to match yours with what your past employer will verify. Rule Number Four ~ Make Sure You Know What Your Past Employers Will Say About You. Either contact them yourself or hire a professional to verify what information they will release ~ and make sure your resume reflects this. If you find that what your employer is going to say is not accurate in any way, it is best to be up front and explain this to any possible future employer. The fact is that there are no federal laws restricting what a past employer can disclose. If you were fired, be prepared that any background check will discover that. It is also possible to find out why you were terminated. However, fear of litigation makes many companies careful about what they reveal about your past employment. Whatever information they disclose must be truthful. For this reason many adopt policies that verify dates, title, and salary only (and many times this requires a signed release). Rule Number Five ~ Make Sure You can Mitigate Any Employment “Gaps” or Inaccuracies. If there are periods of time where you were unemployed or taking time off to gain additional experience, be ready to explain this to any possible employer. Rule Number Six ~ Make Sure to Do a “Background Check on Yourself. Since a check for past criminal records is most likely part of any employment background check, it is crucial to know what they will find. Many companies will also take a look online to see what is listed on the major social media sites like Facebook, Twitter, and LinkedIn. Knowing what will be revealed is key. You can read more about making sure your background check won’t result in any surprises in my article “Why You Should Run a Background Check on Yourself”. What is important is that you put your best foot forward to get the job you want. 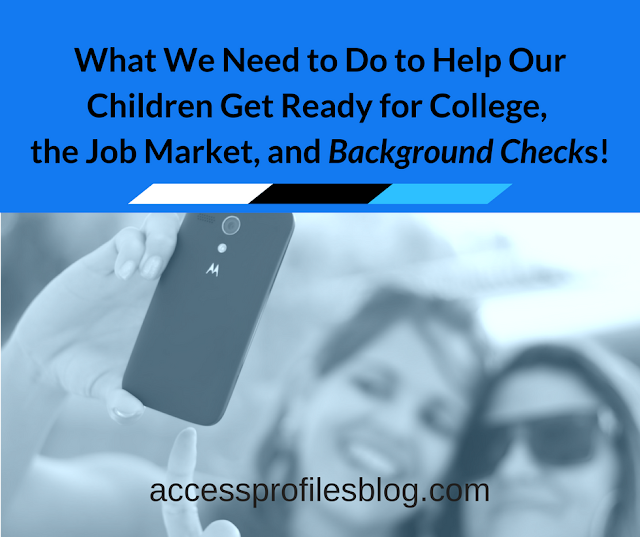 Ensuring your Resume is “Background Check Ready” is your best first step. API can Help You Get the Job You Want! 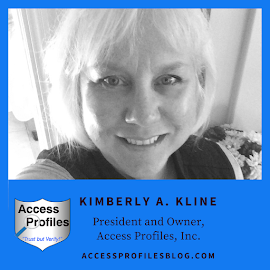 Discover more about us and what we can do for you on my "About" & "Services" pages! Great advice Milna, especially for those who have been in the workforce for some time. And many times an employer will specifically ask for a list of employers for a certain number of years back (usually 7 to 10). However, making sure to highlight experience that directly relates to the job you are applying for makes sense. Thanks for weighing in! It’s true that grammar is important to the overall quality of your summary. And if you are having problems with spelling, I would recommend checking out your resume at site https://resumestairway.com/. Then it will look like as a professional resume and the employer exactly will offer you a job. Thanks for the suggestion Toni!